Follow That Dream (FTD), Sony Music's official Elvis Presley collectors label, was launched in 1999 to serve the dedicated Elvis fan. Its mandate is to complement the commercial and artistic level of Sony Music's retail release schedule by issuing repertoire that is considered of interest to serious Elvis fans and collectors, material that is generally not part of mainstream Sony Music label releases to the public at large. This special material is being marketed directly to fans and collectors through fan clubs, specialist magazines, chosen retailers and dedicated mail order companies only. Follow That Dream is pleased to announce a 5″ digipack release entitled Elvis: St. Paul to Witchita – October ’74 containing the original soundboard recordings of Elvis in excellent form from the fall tour of 1974. This 2xCD showcases Elvis was in great form and with a varied repertoire. CD2: Recorded at the Henry Levitt Arena, Wichita State University, Wichita, Kansas on October 7th 1974: CC Rider (late start) / I Got A Woman – Amen / Love Me / Blue Suede Shoes / The Wonder Of You / Big Boss Man / Fever / If You Love Me (Let Me Know) / Love Me Tender / Hound Dog / Introductions including Lawdy, Miss Clawdy / All Shook Up / (Let Me Be Your) Teddy Bear – Don’t Be Cruel / Why Me Lord / Let Me Be There / When It’s My Time (performed by The Stamps) / Johnny B. Goode / Heartbreak Hotel / Hawaiian Wedding Song / Polk Salad Annie / Can’t Help Falling In Love / Closing Vamp. Bonus songs recorded at the Olympia Stadium, Detroit, Michigan on October 4th 1974: It’s Midnight / Steamroller Blues / Funny How Time Slips Away). This great title finally gets the full FTD Classic Album upgrade! This legendary album released in 1959 while Elvis was serving his time for the US Army in Germany, now features bonus tracks including radio and TV performances from the ‘50s and the quality highlights from the recently discovered Bad Nauheim home recordings. Great performances from the Milton Berle Show, Stage Show and the Steve Allen Show are complemented by intimate recordings of Are You Lonesome Tonight?, His Hand In Mine and He Knows What I Need. Released in 7” gatefold format, it also contains a 16-page booklet. Disc 1: The Original Album: Side 1: That’s All Right / Lawdy, Miss Clawdy / Mystery Train / Playing For Keeps / Poor Boy. Side 2: My Baby Left Me / I Was The One / Shake, Rattle And Roll / I’M Left, You’Re Right, She’S Gone / You’Re A Heartbreaker. Bonus Tracks: That’S All Right (Takes 1-3) / Harbor Lights (Take 7) / I’M Left, You’Re Right, She’S Gone (Slow Version Takes 4 & 5/M) / When It Rains, It Really Pours. For Radio Fans Only: Live Performances 1954-1955: That’s All Right (October 16th 1954, The Louisiana Hayride, Municipal Auditorium, Shreveport) / Blue Moon Of Kentucky (October 16th 1954, The Louisiana Hayride, Municipal Auditorium, Shreveport) / Fool, Fool, Fool (January 6th 1955, Radio Station Kdav, Lubbock, Tx) / Hearts Of Stone (January 15th 1955, The Louisiana Hayride, Municipal Auditorium, Shreveport) / Shake, Rattle And Roll (January 19th 1955, Radio Station Wjoi, Florence, Al) / Money Honey (January 22nd 1955, The Louisiana Hayride, Municipal Auditorium, Shreveport) / I Don’T Care If The Sun Don’T Shine (January 22nd 1955, The Louisiana Hayride, Municipal Auditorium, Shreveport) / Little Mama (Likely March 5th 1955, The Louisiana Hayride, Municipal Auditorium, Shreveport) / You’Re A Heartbreaker (Likely March 5th 1955, The Louisiana Hayride, Municipal Auditorium, Shreveport) / Good Rockin’ Tonight (Likely March 19th 1955, Eagles Hall, Houston, Tx) / I Got A Woman (Likely March 19th 1955, Eagles Hall, Houston, Tx) / Tweedlee Dee (April 30th 1955, The Louisiana Hayride (Remote), Gladewater High School, Gladewater) / I’m Left, You’Re Right, She’S Gone (July 2nd 1955, The Louisiana Hayride, Municipal Auditorium, Shreveport) / Baby Let’s Play House (August 20th 1955, The Louisiana Hayride, Municipal Auditorium, Shreveport) / Maybellene (August 20th 1955, The Louisiana Hayride, Municipal Auditorium, Shreveport) / I Forgot To Remember To Forget (October 29th 1955, The Louisiana Hayride, Municipal Auditorium, Shreveport). Disc 2: For TV Fans Only: Live Performances 1956: Stage Show (CBS) (akaThe Dorsey Brothers Show): Shake, Rattle And Roll/Flip, Flop And Fly (January 28th 1956, CBS Studio 50, New York) / I Got A Woman (January 28th 1956, CBS Studio 50, New York) / Baby Let's Play House (February 4th 1956, CBS Studio 50, New York) / Tutti Frutti (February 4th 1956, CBS Studio 50, New York) / Blue Suede Shoes (February 11th 1956, CBS Studio 50, New York) / Heartbreak Hotel (February 11th 1956, CBS Studio 50, New York) / Tutti Frutti (February 18th 1956, CBS Studio 50, New York) / I Was The One (February 18th 1956, CBS Studio 50, New York) / Blue Suede Shoes (March 17th 1956, CBS Studio 50, New York) / Heartbreak Hotel (March 17th 1956, CBS Studio 50, New York) / Money Honey (March 24th 1956, CBS Studio 50, New York) Heartbreak Hotel (March 24th 1956, CBS Studio 50, New York). The Milton Berle Show (NBC-TV): Shake, Rattle And Roll (April 3rd 1956, The USS. Hancock, Naval Station, San Diego) / Heartbreak Hotel (April 3rd 1956, The USS Hancock, Naval Station, San Diego) / Blue Suede Shoes (April 3rd 1956, The USS Hancock, Naval Station, San Diego) / Hound Dog (June 5th 1956, NBC Color City Studios, Burbank) / I Want You, I Need You, I Love You (June 5th 1956, NBC Color City Studios, Burbank). The Steve Allen Show (NBC-TV): I Want You, I Need You, I Love You (July 1st 1956, The Hudson Theatre, New York) / Hound Dog (July 1st 1956, The Hudson Theatre, New York). Home Recordings. Bad Nauheim, Germany: He Knows Just What I Need / Cool Water (Fragments) / Like A Baby (1 verse) / Return To Me (Fragments) / Her Hand In Mine / His Hand In Mine / Her Hand In Mine / If I Didn’t Care / Are You Sincere / Are You Lonesome Tonight?30 Stand By Me (Fragments). Released as a 5” digipack, this 2xCD set features Elvis in great form from the Las Vegas Hilton Holiday Season shows in December 1975. Disc 1: December 13th 1975 Midnight Show: CC Rider / I Got A Woman - Amen / Love Me / Trying To Get To You / And I Love You So / All Shook Up / (Let Me Be Your) Teddy Bear - Don’t Be Cruel / You Gave Me A Mountain / Help Me Make It Through The Night / Polk Salad Annie / Introductions / Just Pretend / How Great Thou Art / Burning Love / Hound Dog / Softly, As I Leave You / America / It’s Now Or Never / O Solo Mio / Little Darlin’ / Little Sister / Can’t Help Falling In Love. Disc 2: December 6th 1975: CC Rider / I Got A Woman - Amen / Love Me / Fairytale / Instrumental / And I Love You So / Trying To Get To You / All Shook Up / (Let Me Be Your) Teddy Bear - Don’t Be Cruel / One Night / Polk Salad Annie / Introductions / Just Pretend / How Great Thou Art / Burning Love / Softly, As I Leave You / America / Can’t Help Falling In Love (last bars missing). The FTD label is pleased to announce the release of this beautiful 5” 2xCD digipack set featuring Elvis in great form from his legendary Vegas shows in August 1972 at the Hilton Hotel. The release consist of the midnight shows from August 11th and 12th. Between Madison Square Garden and Aloha From Hawaii, Elvis’ shows were at their peak! Elvis was on top form with both new and old numbers in his repertoire, and especially with the addition of three great new songs, What Now My Love, Fever and My Way. In an effort to find the right style for each arrangement, Elvis totally commits himself to every performance. The opening lines of What Now My Love will send chills down your spine! The shows are in above average ‘soundboard quality’ but unfortunately, the ending is missing from the second show. Elvis: The Viva Las Vegas Sessions. DISC ONE: Soundtrack: Viva Las Vegas / Yellow Rose Of Texas - The Eyes Of Texas / The Lady Loves Me / C’mon Everybody / Today, Tomorrow And Forever / The Climb (planned record version - take 3) / What’d I Say / Santa Lucia / If You Think I Don’t Need You / I Need Somebody To Lean On. Bonus Songs:Night Life / Do The Vega / You’re The Boss. First Takes: Viva Las Vegas (take 1) / Yellow Rose Of Texas - The Eyes Of Texas (take 7) / The Lady Loves Me (takes 1-2) / C’mon Everybody (take 3) / Today, Tomorrow And Forever (takes 1-3, 5 & 4) / What’d I Say (takes 1-2) / Santa Lucia (v.o. take 1) / If You Think I Don’t Need You (takes 1-2) / I Need Somebody To Lean On (takes 1-2) / Night Life (take 2) / Do The Vega (take 1) / You’re The Boss (takes 1-3) / Today, Tomorrow And Forever (2012 takes 1-2, duet). DISC TWO: Outtakes:Night Life (takes 1 & 3) / Night Life (takes 4-8) / C’mon Everybody (takes 1-2 & 4-5/M) / If You Think I Don’t Need You (takes 3-7) / I Need Somebody To Lean On (takes 3-5) / I Need Somebody To Lean On (takes 6-8) / Do The Vega (take 2) / Santa Lucia (track, takes 1-2) / Viva Las Vegas (take 2) / The Climb (takes 1-2 & 4-7) / Yellow Rose Of Texas - The Eyes Of Texas (takes 1-4) / Yellow Rose Of Texas - The Eyes Of Texas (takes 5-6 & 8-9/M) / The Lady Loves Me (takes 3-6) / You’re The Boss (takes 4-8) / You’re The Boss (takes 9-10) / Today, Tomorrow And Forever (2012 take 6, instrumental) / Santa Lucia (vocal overdub, take 2) / Santa Lucia (vocal overdub, take 3) / Today, Tomorrow And Forever (movie version, vocal overdub 2016 take 8) / What’d I Say (takes 3-4/M). DISC THREE: Movie Tracks: C’mon Everybody (movie version, take 7 with overdubs) / Today, Tomorrow And Forever (movie version, v.o. take 10, edited) / The Climb (movie version - take 9, edited) / Santa Lucia (v.o. take 6/M, movie version) / Appreciation (Ann-Margret, take 3 & pickup take 2) / My Rival (Ann-Margret).Outtakes: Night Life (takes 9-10) / Night Life (take 11) / Night Life (takes 12-13) / If You Think I Don’t Need You (takes 8-10) / If You Think I Don’t Need You (takes 11-13/M) / I Need Somebody To Lean On (takes 9-15) / I Need Somebody To Lean On (takes 16-19) / Do The Vega (takes 3-7/M) / Viva Las Vegas (takes 3-7/M) / The Climb (take 8) / The Climb (take 9) / C’mon Everybody (takes 6-7/M, movie version) / The Lady Loves Me (takes 7-9) / You’re The Boss (takes 11-12) / You’re The Boss (takes 13, 15 & 14) / Santa Lucia (vocal overdub, take 5) / Today, Tomorrow And Forever (movie version, 2016 vocal overdub take 10/M). FTD is pleased to announce the release of February 1970 Revisited - Off-On Stage. Released as a 7” digipack, this CD features Elvis in great form from his legendary shows in February 1970 at the International Hotel, Las Vegas. The album contains 12 unreleased performances and 4 newly remixed tracks. I Got A Woman* (February 16th 1970 M/S) / Long Tall Sally* (February 16th 1970 M/S) / Let It Be Me (Je t’appartiens)* (February 16th 1970 M/S) / Don’t Cry Daddy* (February 17th 1970 D/S) / I Can’t Stop Loving You* (February 17th 1970 D/S) / Walk A Mile In My Shoes* (February 17th 1970 D/S) / Sweet Caroline* (February 17th 1970 D/S) / Kentucky Rain* (February 19th 1970 D/S) / Polk Salad Annie* (February 17th 1970 D/S) / Proud Mary (February 19th 1970 D/S – Previously released in a different mix on ‘Polk Salad Annie’ / Release Me (And Let Me Love Again) (February 19th 1970 D/S – Previously released in a different mix on ‘Polk Salad Annie’ / CC Rider (February 19th 1970 D/S – Previously released in a different mix on ‘Elvis: Today, Tomorrow And Forever’ / The Wonder Of You (February 18th 1970 M/S) – Previously released in a different mix on ‘Elvis 30 #1 Hits’. Bonus songs: Don’t Cry Daddy* (February 16th 1970 M/S) / Kentucky Rain* (February 16th 1970 M/S) / Love Me Tender* (February 16th 1970 M/S). FTD is pleased to announce the release of Elvis: Omaha Nebraska '74 which is a 5” digipack 2xCD set featuring both the Afternoon and Evening shows at the Omaha Civic Auditorium on June 30th 1974. Disc 1- June 30th 1974, Afternoon show 2:30pm: CC Rider / I Got A Woman - Amen/ Love Me / Trying To Get To You / All Shook Up / Love Me Tender / Hound Dog / Fever / Polk Salad Annie / Why Me Lord / Suspicious Minds / Introductions / I Can’t Stop Loving You / Help Me / American Trilogy / Let Me Be There / Funny How Time Slips Away / Big Boss Man / Steamroller Blues / Can’t Help Falling In Love / Closing Vamp. Disc 2 - June 30th 1974, Evening show 8:30pm: CC Rider / I Got A Woman - Amen / Love Me / Trying To Get To You / All Shook Up / Love Me Tender / How Great Thou Art / Hound Dog / Fever / Polk Salad Annie / Why Me Lord / Suspicious Minds / Introductions / I Can’t Stop Loving You / Help Me / Bridge Over Troubled Water / Let Me Be There / Happy Birthday / Funny How Time Slips Away / Big Boss Man / My Way / Steamroller Blues (incomplete). Follow That Dream (FTD) is pleased to announce the release of Elvis: Murfreesboro '74. Released as a 5” digipack, this 2xCD set features Elvis in great form from two shows on March 14th and 19th at the Murfreesboro Middle State Tennessee University. The sound quality and performances from Elvis and the band are really powerful. Steamroller Blues will knock your socks off! Disc 1 - March 14th 1974: Also Sprach Zarathustra / CC Rider / I Got A Woman - Amen / Love Me / Trying To Get To You / All Shook Up / Steamroller Blues / (Let Me Be Your) Teddy Bear - Don’t Be Cruel / Love Me Tender / Johnny B. Goode / Hound Dog / Fever / Polk Salad Annie / Why Me Lord / Suspicious Minds / Introductions / I Can’t Stop Loving You / Help Me / American Trilogy / Let Me Be There / Funny How Time Slips Away / Can’t Help Falling In Love / Closing Vamp. Disc 2 - March 19th 1974: Also Sprach Zarathustra / CC Rider / I Got A Woman - Amen / Love Me / Trying To Get To You / All Shook Up / Steamroller Blues / (Let Me Be Your) Teddy Bear - Don’t Be Cruel / Love Me Tender / Medley: Long Tall Sally - Whole Lotta Shakin’ Goin’ On - Mama Don’t Dance - Flip, Flop and Fly - Jailhouse Rock - Hound Dog / Fever / Polk Salad Annie / Why Me Lord / Suspicious Minds / Introductions / I Can’t Stop Loving You / Help Me / American Trilogy / Let Me Be There / Funny How Time Slips Away / Mystery Train (incomplete). As part of it's Classic Album series, FTD is pleased to announce the release of the original soundtrack album for the Kissin' Cousins movie. It features unreleased outtakes, rarities and an informative illustrated 16-page booklet with rare memorabilia, movie trivia and photos. Due to the small amount of existing outtakes (as Elvis didn’t record with the band) it includes instrumental masters recorded at the RCA Studio in Nashville that show the great musicianship of the players. Follow That Dream is pleased to announce the release of the legendary bicentennial show in a 2xCD digipack format. Finally, Elvis’ last soundtrack recordings are brought together in a cohesive release that works as a companion set for the FTD 7” Classic Album series. Elvis: The Last Movies contains outtakes and an informative illustrated 16-page booklet with rare memorabilia and photos. 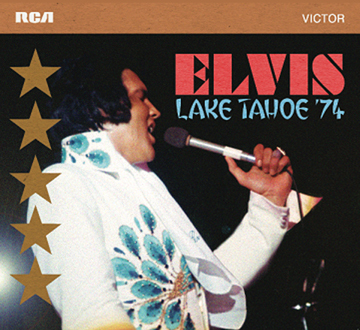 Following on from the recent (Las Vegas ’74 and Elvis In Atlanta, releases, FTD will soon release Lake Tahoe ’74 featuring shows from May 25th and May 26th. This will be 2xCD 5” digipack release. This great 2xCD 5" digipack release contains two legendary soundboard shows from the Hilton Hotel on August 20th 1974 mastered by Jan Eliasson. Disc 1 - August 20th 1974 – Dinner Show: CC Rider / I Got A Woman - Amen / Love Me / If You Love Me (Let Me Know) / It’s Midnight / Big Boss Man / Fever / Trying To Get To You / Love Me Tender / All Shook Up / I’m Leavin’ / Softly As I Leave You / Hound Dog / You Gave Me A Mountain / Polk Salad Annie / Introductions (part missing) / If You Talk In Your Sleep / Why Me Lord / (Let Me Be Your) Teddy Bear - Don’t Be Cruel / Heartbreak Hotel / Bridge Over Troubled Water / Hawaiian Wedding Song / Let Me Be There / Can’t Help Falling In Love. Bonus Song (Recorded September 2nd 1974 Midnight Show) It’s Now Or Never (second version). Disc 2 - August 20th 1974 – Midnight Show: CC Rider / I Got A Woman - Amen / Love Me / If You Love Me (Let Me Know) / It’s Midnight / Proud Mary / Trying To Get To You / Big Boss Man / Fever / Promised Land / Love Me Tender / All Shook Up / I’m Leavin’ / Softly As I Leave You / Hound Dog / You Gave Me A Mountain / Polk Salad Annie / Introductions / If You Talk In Your Sleep / Why Me Lord / (Let Me Be Your) Teddy Bear - Don’t Be Cruel (incomplete) / Hawaiian Wedding Song (incomplete) / Let Me Be There / Can’t Help Falling In Love. Bonus Songs (Recorded August 28th 1974 Dinner Show) Help Me / My Boy / How Great Thou Art. Elvis In Atlanta contains two legendary shows from the Omni Coliseum in 1975 on April 30th and May 1 respectively. This soundboard release is another in the 5” 2xCD digipack range. The digipack features great photos taken by Keith Alverson and the CDs are mastered by Jan Eliasson. CD1 – April 30th 1975: Love Me / If You Love Me (Let Me Know) / Love Me Tender / All Shook Up / Teddy Bear – Don’t Be Cruel / I’ll Remember You / Help Me / How Great Thou Art / Introductions / My Boy / T-R-O-U-B-L-E / It’s Now Or Never / Let Me Be There / An American Trilogy / Burning Love / Funny How Time Slips Away / That’s All Right / Can’t Help Falling In Love / Closing Theme. CD2 – May 1st 1975: Love Me / If You Love Me (Let Me Know) / Love Me Tender / All Shook Up / Teddy Bear – Don’t Be Cruel / Help Me / Why Me Lord / Burning Love / Introductions / My Boy / T-R-O-U-B-L-E / I’ll Remember You / Let Me Be There / An American Trilogy / Help Me Make It Through The Night / That’s All Right / Can’t Help Falling In Love / Closing Theme. The opening numbers of 2001 / CC Rider / I Got A Woman / Amen were not recorded at either shows. Recorded at the Omni Coliseum (a.k.a. The Omni), Atlanta, Georgia. These recordings are so-called ‘soundboard’ recordings, done with semiprofessional equipment. There are several flaws on the original source tapes.